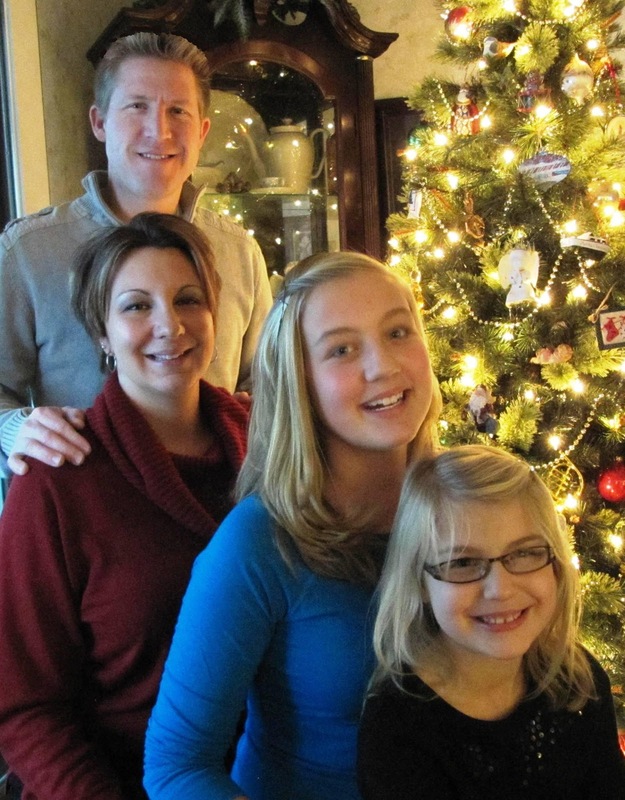 Well, it's been a really fun Christmas season with the family. Had some good food, fun times, great pictures, and saw a fabulous movie. I HIGHLY recommend seeing Les Miserables...different from anything I've seen on stage or in the theatre before. Erin and I loved it. So after all the "together" time, I had some fun yesterday with a few of my favorite products. 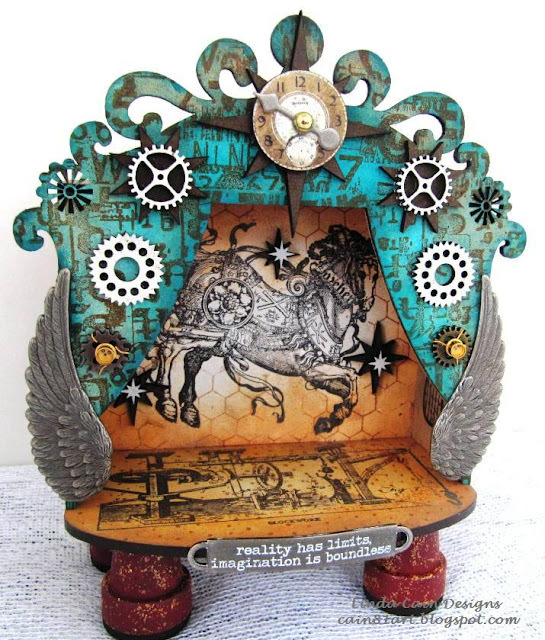 Here I used the really great Steampunk Theatre Shrine from Retro Cafe Art, Fresco Finish Paints, Tim Holtz, and Lynne Perrella Paper Artsy Stamps. IMHO they worked beautifully together! The Numbers Border is from Danelle Johnson, Tim Holtz's Mixed Media chickenwire , and the Horse is from Lynne Perrella's 019 Paper Artsy collection. This starts out as a kit. You can paint, paper, decorate, or stamp each one before assembling the piece. All the Masonite gears come in this kit. Shown here is after it's glued together. I changed it around a bit. This shows how the pieces go together easily with a bit of glue...night picture, of course as I can seldom work in the daylight...Vampire that I am. This is a detail shot of the gears and such. The stars are from the Star Mix Cutouts that have 48 wonderful pieces. I used some in the natural Masonite color, and some painted with Snowflake Fresco Finish...2 coats. The entire kit was base coated with Snowflake, then I used Autumn Fire, Smoked Paprika, and Mocha Mousse over the top. Sepia, Venetian Orange, and Jet Black Archival Inks were used to stamp onto the surfaces. Then heat set them. 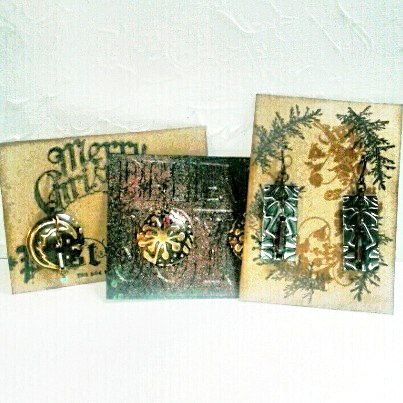 This shows the Tim Holtz stamp from the Remnants collection, and a Word Band with some white paint to accent the words. Here you can see the side painted basically with the Mocha Mousse and stamped with the Lynne Perrella 017 image. LOVE that collection! The Dragonfly inside is from Hot Picks 1104 collection at Paper Artsy. The Wings, Mini Gears and Spinner are Idea-ology pieces. The gold pieces over the Mini Gears are actually computer parts a friend gave me. Cool, eh? 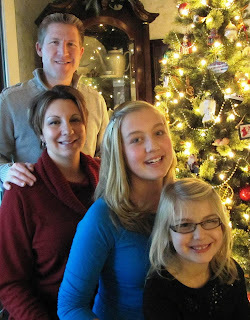 So I'll leave you with a couple of shots of the kids and grandkids. Funny, talented, and really cute! The Neavors....son Jeff, Ann, Erin and Emma.....not everyone wanted their picture taken, but we got a few. Erin doing her Buddy the Elf on Papa Elf's lap impression! The Haifa's....Britta, daughter Michelle, Alex, and Carlo. Sister and Brother...Brit and Alex. That's it for today. Have a safe New Years. It's just snowing lightly or spitting snow (ew) as my Mom used to say. So it should be cold and dreary here, but no 18" of snow like Southern Illinois got. Leandra with Paper Artsy has decided to have a whole year of Guest Designers...each taking a 4 month stretch with a certain week of the month to design for them. And she asked me to be one of the Designers!!!! YAY!!! I have LOVED PA stamps FOREVER....I remember the first time I saw a whole rack of them up by Chicago years ago. They were there hidden for a special sale in the back. Anyhow, I just received a huge box of goodies from Mr. Paper Artsy...stamps, paints, papers, tags, and so on and so forth. I AM THRILLED! My oldest granddaughter, Britta, the budding Artist, LOVES the Russian Nesting Dolls. 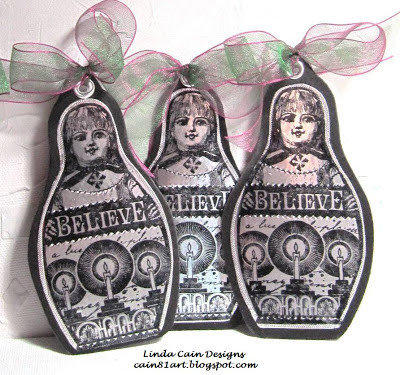 So when I saw these gorgeous stamps from Paper Artsy's Lynne Perrella collection, I KNEW exactly what needed to be done with them. They are stamped on the Metal Card (this stuff is so cool) with Staz-On ink and cut out. 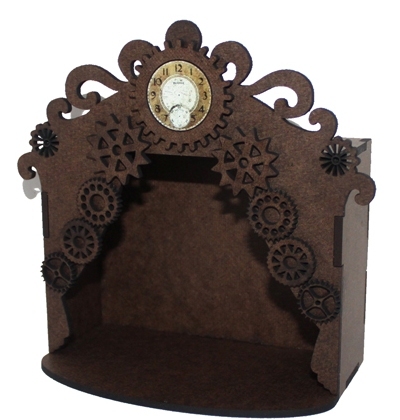 They're layered onto black chipboard, punched a hole and added an eyelet, and tied a piece of gorgeous ribbon in them. 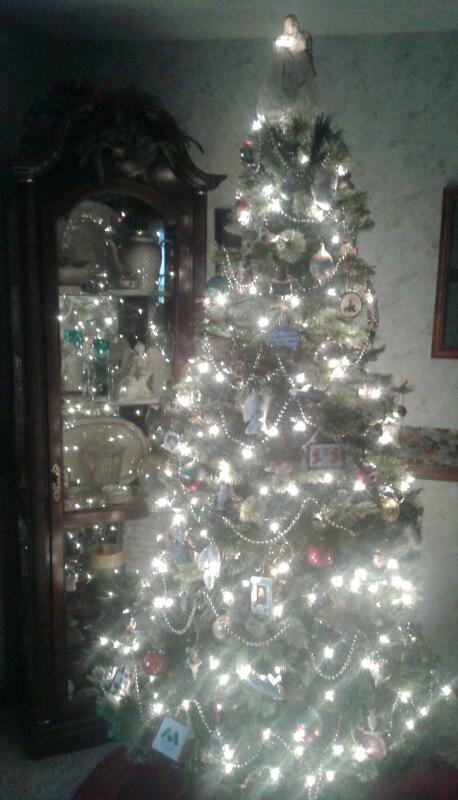 I tied gold cord to string them onto the tree. Fun, easy, and they are so pretty, they need nothing else. IMHO! You MUST go and watch Leandra's fabulous Video Tutorials here. I learned soooooo much from them. Brilliant work. So look for me the 3rd week of the January, February, March and April on the blog here. You never know what all of us will come up with! I made a fun card with the new Mario Rossi Jr.'s gorgeous stamps, Christmas Blueprint from Tim Holtz. This Snowman is just so stinkin' cute. I didn't think it would be so much fun! This is on watercolor paper and stamped with Black Soot Distress Ink. Then it's embossed with Super-Fine Detail Clear Embossing Powder. The background had water laid down around the snowman and Prussian Blue watercolor paint was added in layers. Before it dries completely, you have to add regular Table Salt to create the little blue circles that dry in the paint. It's tricky, but can be done. Adding it at just the right time makes it happen. I added many, many different colors of Markers...Distress and Tombow to the Snowman and background. JOY was written on a Jewelry Tag and a bit of Tea Dye Distress Ink added to the edges. A White Pen was used to put a few drops of snow over the blue. Christmas Red dots of Ice Stickles make the Holly stand out on the Hat, and a Candy Cane from Petaloo adds a bit of whimsy. Layer it onto a layer of black and red cardstock, and then onto a tan card. That's it for today, hope you enjoy! And a wonderful Holiday Season to All my friends of every religion. We took a fun trip down to Branson for a couple of days. 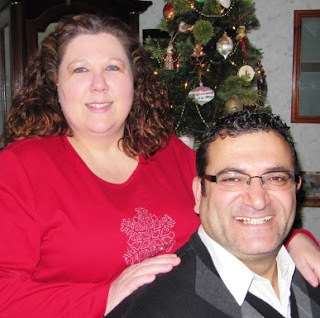 Saw a few shows, laughed a lot, were amazed with Joseph's HUGE set, sang some Christmas songs and ate good food. On the trip I got an email request for a fun new adventure for next year....it was too good to pass up...more to follow on that later. But BEFORE we left Kristin Hubick from Retro Cafe Art sent me some WONDERFUL things to play with. These are so much fun...easy to put together...and just loads and loads of ways to make them your own. Take a look at the 3 Chipboard Tower Houses. These come in a flat sheet, laser cut, and VERY easy to decorate after, during, or before you glue the sides up. The little numbers came in the kit and I used UTEE on them. The Papers are 7Gypsies 6x6 paper pad Gypsy Market. Thinner papers work well on these type of pieces. I added Kristin's German Dresden-Fancy Border on this roof under Brushed Pewter Distress Stain. The Distress Stains work WONDERFULLY on these. Extremely easy to cover. I used UTEE on the 2, but found it too light for this house, so I a painted on Gold Metallic Mixative to lighten it up. This side view shows more of the German Scrap that's perfect for these little gems. I added a strip of tiny Red Rhinestones and a Black Zig Zag Stitched Ribbon. The Red German Dresden Mini Border and Silver German Dresden- Baroque on the roof here were fun to add different patterns and colors. I used the Antique Brass and Resin Pocketwatch Charm on the front. This is a shot of the backs with some penwork and stamping. The one on the right has that cool image on the 7Gypsies paper...LOVE it! The houses were base coated with Antique Bronze, Tarnished Brass, and Brushed Pewter Distress Stains. These and MANY other items are on sale now at Retro Cafe Art! Be sure to check out the Exploding Box Kits and Shrines....amazing! This shows you the Silver Mini Dresden on the side front section with the Gold Rick Rack and Rhinestones. The roof is Metal Foil Tape that was embossed and colored with Stream and Espresso Alcohol Ink. The 4 was done with Platinum UTEE. The last shot is with the fun Woodlands Bottle Brush Trees from Tim Holtz...also on sale..I'm just sayin'. So check out this great site...tell them Linda sent you...and try some of these little cuties for fun gifts or for yourself. More later on a new adventure for next year .... should be exciting! Life is a Journey....enjoy the Ride. How true. And we've been making Earrings!!!!! I've dabbled in so many different things since I retired. Always loving whatever medium I've chosen at the time. I LOVE METAL....in all the things I've done...metal has always had it's place. But today I've got to show you the Amazing Work of Britta Haifa...my granddaughter...the oldest. 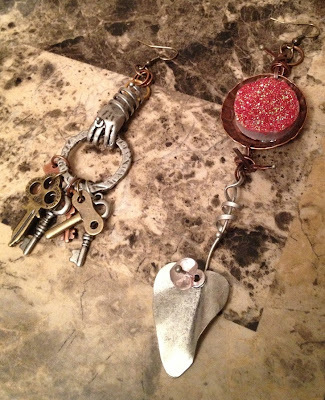 These Steampunk Earrings are ones she made for a friend who loves being a bit eccentric and punky. I LOVED THEM! The keys are just too cool for words and the hand...holding the keys to a cell perhaps??? And the gorgeous wrapped piece with the dapped disk..what's not to love? Now a certain type of person could only do these justice...a younger gal with longer hair would be perfect...can't wait to see an updated pic, Brit! These are what I started with...Artisan Copper Discs that were embossed and dapped with the Wood Dapping Block to make them more interesting. I've become a Dapping Fiend. So fun, and so easy! Thanks to Jess Italia-Lincoln and her insight on this when I ran into her at her mom Trish's new shop in Galena...Rustic River Finds. You must stop in if you're there on Main Street. The Brass Discs are also sanded after being run through the Vagabond with different Deco Emboss Folders from Vintaj. Beads and jewels are added for a bit of color...see the little tiny stars at the end of the finding on the ones with the Moon? Maybe not....tiny...phone picture. And already wrapped up. These are on the Black discs as well, but larger. I like to mix my metals for interest and color. And these are my happy accident earrings! I used a silver-colored disc, but it moved on me when I embossed it. So the image was off and it had a line in it where the embossing ended. So I thought, can't ruin it any, run it through again....and then just one more time for kicks! And I liked what I saw...sanded, polished and dapped the other way to make concave. Add some crystals with copper beads and they're kinda fun! So get some discs...emboss 'em, pound them with the dapping block (way easy, way fun) and make some presents or keep them for yourself. And I'll leave you with this that was the thought for today from Teri Martin.
" Life is a series of natural and spontaneous changes. 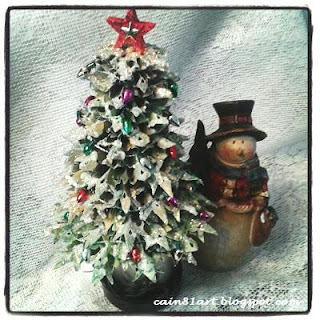 I've spent as much time trying to get a "sparkly" photo of this tree as I did making it!!! I know that glitter and bling are very difficult to shoot....but this thing is all about the sparkle. The only way I can get the thing to shine is with Instagram. This is made with lots and lots of Sizzix Snowflake and Mini Snowflakes Rosesttes from Tim. I ran green papers from the Retro Grunge paper stash collection through the Vagabond. The bottom 2 rows are 2 pieces glued together to make a larger section that I glue to paper circles. 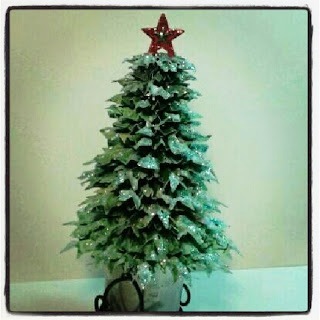 This is the tree all glued together with hot glue. I added Glue n' seal to the branches and then sprinkled a couple of layers of Distress Stickles Dry Glitter on them. The wooden star is painted Fired Brick with Distress Stains and Christmas Red Ice Stickles are added when dry. A small gold star is glued to the front and back. But it still needed MORE...so the little tiny Christmas Lights from Darice were perfect to add more color. IMHO. This is a natural light, but it doesn't look good to me since the gold mica in the Stickles disappears when you try to photograph it! It's sitting on a candle holder I used Mirror Finish spray paint on for the Mercury glass technique with a battery candle flickering in it. So try it, use your imagination. See what you come up with...these 2 dies are so much fun! This is our new Slim Tree....smaller, but easier to get out of the attic. Our old tree looks beautiful in Brit's appartment. A perfect new home.